India’s leading leisure hospitality provider Mahindra Holidays & Resorts has been awarded the prestigious Golden Peacock Award for Sustainability 2017. 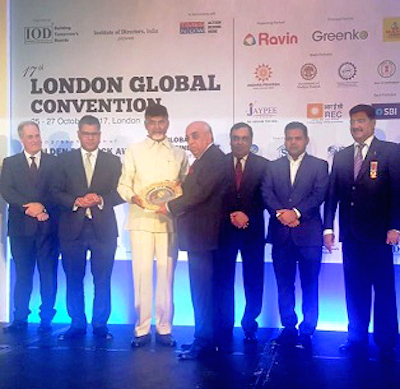 The award was presented to the company’s chairman Arun Nanda, during a glittering ceremony held in London. Since its inception, Mahindra Holidays – whose flagship brand Club Mahindra is an RCI affiliate – has focused on driving sustainability across the business, implementing a robust sustainability practice across its network of 50 resorts in India and overseas. Key areas that the company has been working on include carbon footprint measurement, conservation of biodiversity and assessment, environment, energy, water and community development. To reiterate its pledge to sustainability and conservation, Mahindra Holidays joined EP100, making a commitment to double its energy productivity by 2030. It also became the first global hospitality company to take on a leadership role in energy productivity and actively supporting India’s national commitments to mitigate the impacts of climate change. The company has taken several initiatives such as the use of solar power plants and provisioning of newer technologies and energy-efficient machines at new projects. In addition, measures are being taken to conserve power, water and deployment of biogas plants and compost machines for recycling dry and wet garbage. Mahindra has also invested in equipment upgrades, such as switching to light-emitting diode (LED) lighting, highly efficient heat pumps and variable frequency drives at its resorts. Mahindra Holidays actively participates in its parent company Mahindra Group’s initiative for Corporate Sustainability Reporting. The Group’s ‘Sustainability Report’ of the Group is prepared in accordance with the internationally accepted framework specified by the Global Reporting Initiative (GRI). This framework sets out the principles and indicators used to measure and report economic, environmental, and social performance.